I have written an article regarding the move from Tsukiji to Toyosu for AFAR magazine. It lists some of the shops and restaurants in the new Toyosu Market and more about the move. This post is about the issues that came up today. Access. While Tsukiji Market is conveniently located in the heart of the city near Ginza and is accessible with two subway lines. The new Toyosu Market is on an island that must be accessed over a few bridges. Public transportation is via the monorail or limited bus service. The monorail is not only expensive it is inconvenient to access. Many vendors expect what used to be a 15-minute commute will now be over an hour. Today there were big problems with traffic. Some truck drivers said it took over two hours to get into the market. Another commuter said it took him over an hour just to exit the parking lot. A major road accessing the market, Kanjo 2-go Sen, is not completed so traffic is rerouted around. Hopefully this will be resolved soon. Parking. It is estimated about 40,000 people came to Tsukiji Market, both workers and customers. There is not nearly enough parking spots in the new market. Cold chain. The new Toyosu Market is supposed to be cold-chain-temperature controlled but today the fishmongers shared on social media of temperatures around 80 degrees Fahrenheit and humidity high enough that mold could grow, today reported at 75%. There are no dehydrators in the market. This is not an issue for the seafood but there is concern for the building and equipment molding. Contamination. Toyosu island is polluted with contaminants and already there are issues with water drainage not working properly and water overflowing on site. This is a safety concern for the workers for walking or driving through the water. There is also a major concern about the safety of the water and if it is clean or contaminated. Lighting in the tuna auction. An 8th-generation tuna vendor commented that the overhead lights in the tuna auction room are LED and that it is hard for the tuna buyers to get a true sense of the color of the tuna. He added that the temperature of the auction area is hotter than it should be. Logistics. Several issues with the design of the buildings. The vendor space for some shops are too small and overflow boxes are being put into the roads meant for the turrets to drive around creating a traffic jam within the market. Some of the slopes are too steep for turret drivers to drive up without possibly having product fall off their turrets. Some of the roads within the market for turrets have curves that are too sharp. For tourists, it will open on Saturday, October 13th from 10 a.m. There are 70 retail shops and 39 restaurants. There is very limited viewing of the seafood and produce market. Regarding the tuna auction access will be given based on reservations made through the internet. The first day of public viewing is not until January 15th, 2019. This space is right next to the tuna auction area. There is a different window overlooking the tuna auction space that opens from Monday. This is on the 2nd floor looking down onto the auction. Access for tourists is only via public transportation via the monorail or buses. The Tsukiji Inner Market is already being torn down and is scheduled to be used for the 2020 Olympic and Paralympic Games as a transportation hub. Most likely buses will be used here for parking and staging as it is located near the Olympic Village, several venues and near downtown Tokyo. Following that nothing has been confirmed. 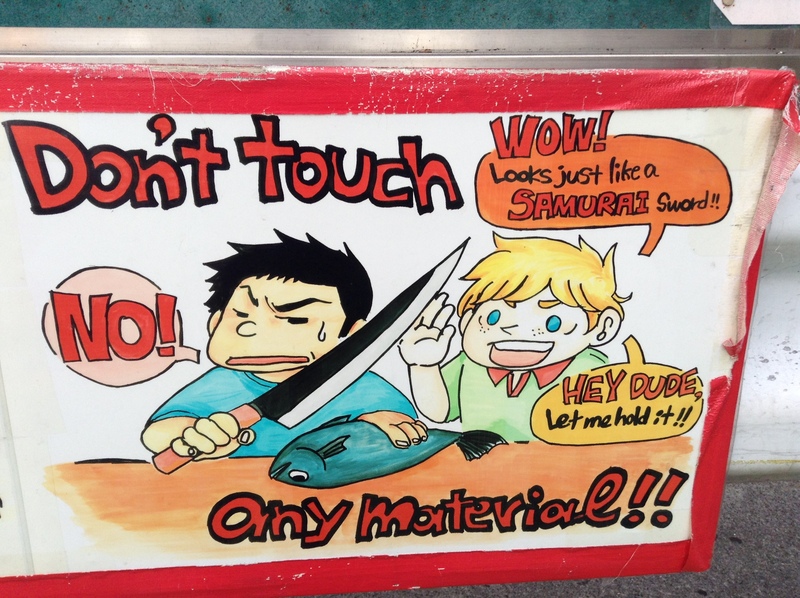 As for Tsukiji Market, the Outer Market is still open for business. The first few days after the Inner Market closed down and started its move to Toyosu, the Outer Market was like a ghost town. Tsukiji Market is in the heart of the city and worth visiting. Plenty of restaurants and shops. There are 60 seafood and produce shops from the Inner Market who have opened a branch in a newer market area called Tsukiji Uogashi. Please come and visit! There is a new documentary movie out called Tsukiji Wonderland. The movie will be released in mid-October, but is currently being shown at the movie theater near Tsukiji. Shinji saw it and said it’s very good. Speakers in the movie include Harvard professor and author of the best book written about Tsukiji, Ted Bestor, and several famous Japanese chefs. In Ginza, the Tokyu Plaza has finally opened up. Highlights include City Bakery in the basement, Bareburger, Tsurutontan, and a Greek restaurant from Australia, The Apollo. Posted in radar, Uncategorized	Tagged Bee Cheng Hiang, Caffeineholic, Ginza, Tokyo, Tokyu Plaza, Toyosu, Tsukiji, Twelv. Our company, Food Sake Tokyo, offers guided food lectures to markets in Tokyo. We are at Tsukiji Market usually four days a week, five if Tsukiji is open that Wednesday. Our business is very much based around Tsukiji Market so we are carefully watching the news and staying up-to-date with our friends who work in the market. Following are updates as we know them, about Tsukiji Market’s move to the new Toyosu Market, which was scheduled to happen on November 7th, but now is on hold. 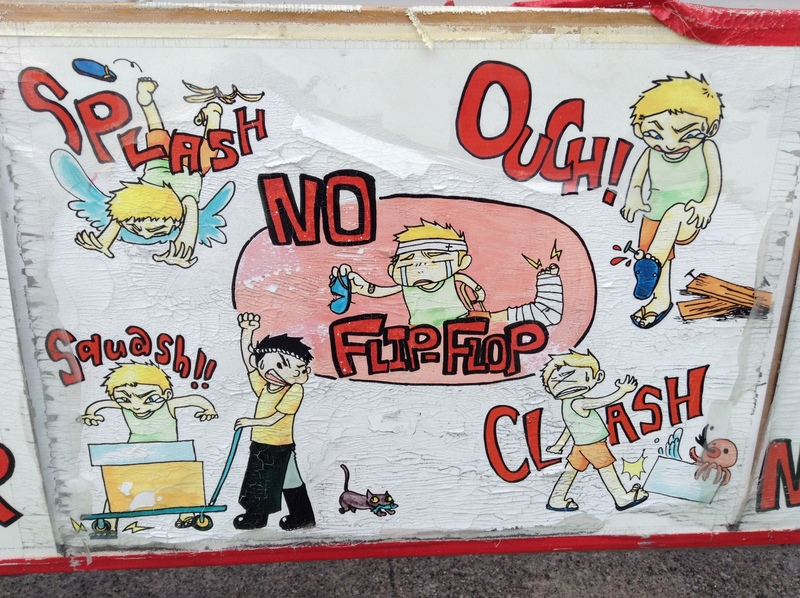 The current location, Tsukiji Market, is in dire needs up upgrades. Food safety standards have changed dramatically since 1935 when the market was originally built. It definitely needs to be upgraded. Another big update is that the decision on if Tsukiji will move to Toyosu has been put off until next summer. The earliest a move will take place would be next winter or the spring of 2018. As the market was scheduled to move on 7 November 2016, a new building was constructed for seafood and produce sales as well as a dining hall, all which is open to the general public. The sales area is open after 9 a.m. but the dining hall is open from 7 a.m. At the moment the shokudo dining hall is quiet as no one seems to know it is there. It is run by an NPO and is offering breakfast and lunch at very reasonable prices. I highly recommend it, you can get away from the crowds and you can get a cheap meal made with ingredients from the market. It is coming to light that part of the ground was not decontaminated. It is not the buildings, but a road that exists between two of the buildings. At first this area was not decontaminated as it is a road, and not considered a part of the Market area. At one point, it was brought up that this area would be used by the fishmongers and that it should be cleaned up, however, it could not be completely cleaned 100% due to physical restrictions (gas pipelines, beams, etc.). A tunnel was constructed between the buildings so that turrets could move seafood from the auction to the wholesale market. Recently this area came up as highly contaminated with benzene at 710 times the allowable amount. Benzene was measured at 7.1 mg/liter when the safe amount in Japan is 0.01 mg/liter. Cyanogen was also found at 70 mg/liter. In other news, Governor Koike has said that it is still unknown who approved the open air basement spaces underneath the buildings. She has said that they are still trying to find out who permitted this oversight and that these people may be held responsible. Governor Koike has returned from the Rio Paralympic Games and now her energy is focused on the Toyosu issue. Odaiba – which is in the relatively same area, however, it is very hard to access. Ota Shijo – home to Tokyo’s largest produce market. There is already a small market here for seafood and flowers as well. A good point of moving Tsukiji here is that it is next to Haneda airport, and a lot of the seafood coming into Tsukiji now comes by plane. Moving to Toyosu on a temporary basis. 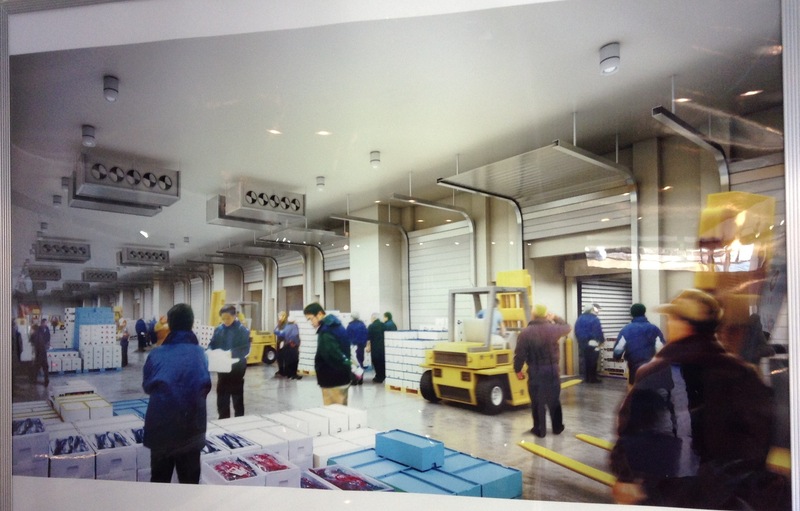 In the meantime, creating a brand new market in the current Tsukiji location and then moving back to Tsukiji. What if the Toyosu Market is never used? The buildings could be converted possibly into a casino or maybe used as storage for non-food items. What if the market moves to Toyosu? Some of the fishmongers at Tsukiji have said that their new space in Toyosu is very expensive. And, that it is inevitable that the prices will go up for seafood and passed along to the customers. What about the water that was found in the new Toyosu site? It is reported that some cyanide was found in the water below the Toyosu buildings. Governor Koike has a team that will report to her at the end of September. At this point, it’s a waiting game. Water was found in the underground space under the new market. It was checked and while benzene was not found, it did have some arsenic, but permissible amounts. Former Tokyo governor Ishihara is saying that he had no idea that the buildings would be built without the required 15 feet of dirt as recommended by specialists. Current governor Koike is expected to have another press conference in the near future. What to do with the Toyosu site, if Tsukiji doesn’t move there? Some are suggesting that the buildings be used for a casino. There is also talk of temporarily moving the market there and rebuilding on the current Tsukiji Market space, and then moving the market back to its current location. Some super-freezers at the new Toyosu site have already been started up. These are not small plug-in machines, but giant buildings that go down to -76 degrees F (-60 degrees C). Once these have been turned on they can NOT be turned off without possibly doing damage to the buildings. These companies are now paying expensive electricity bills for empty super-freezers. The question is who should pay for this? Today in the news it came up that in 2007 a team of specialists recommended the clean dirt be put in over the contaminated dirt before construction of the buildings. Then in 2008 it was decided to ignore the recommendations of the specialists and to construct the buildings directly over the contaminated dirt and to install thick cement floors and walls. However, this new plan was never run past the team of specialists, nor was it told to those at Tsukiji Market. Seems that it was a well kept secret between Tokyo government officials and the construction company. This is so disturbing, frustrating, and most of all, unbelievable. What has come up today is that there is water in this pocket of space under the buildings. It was expected that there would not be any water in this space, which was supposed to be filled with clean dirt. The question today came up with where this water came from. Is it rain water or is it ground water? More importantly, is it polluted? Governor Koike held a press conference today (Saturday in Japan, so obviously urgent news) about a major oversight with the new Toyosu location. 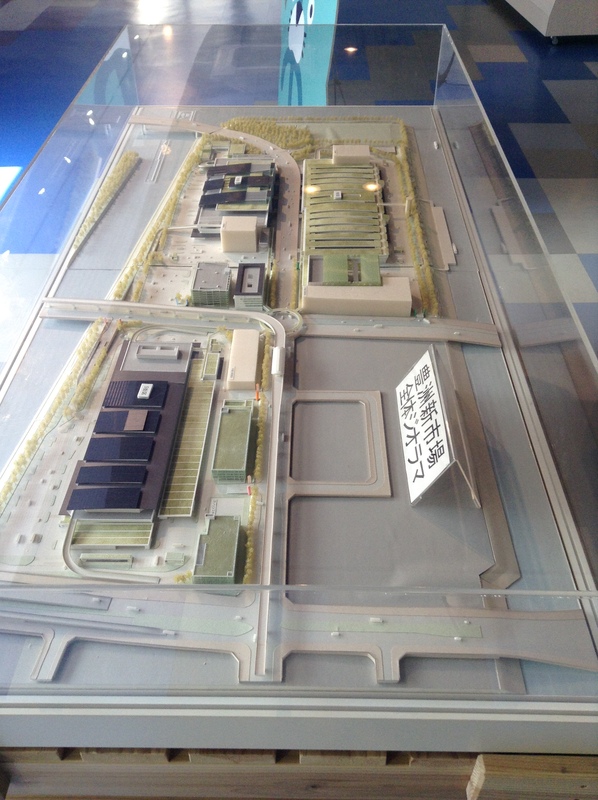 As mentioned in the past, the new Toyosu Market location was priorly used by Tokyo Gas as a coal plant. The ground is polluted, which has been known from day one. Part of the delay for the move, which was originally scheduled to happen in 2014, was because the topsoil was being dig up and decontaminated. The decontaminated soil was to be returned and then was to be covered by more dirt. The buildings were constructed without the required 4.5 meters of clean ground (about 15 feet). The photo shows a building with what looks like a basement. In fact, that basement is meant to be completely filled in with clean dirt. How unbelievable is this? Seriously. This process of decontaminating the dirt and putting it back and covered before construction of the buildings were to begin. In today’s press conference Governor Koike said that her Project Team (see below) will continue to look into the Toyosu Market and will make their recommendations early next year. For now, we can just stay tuned for news updates like today. 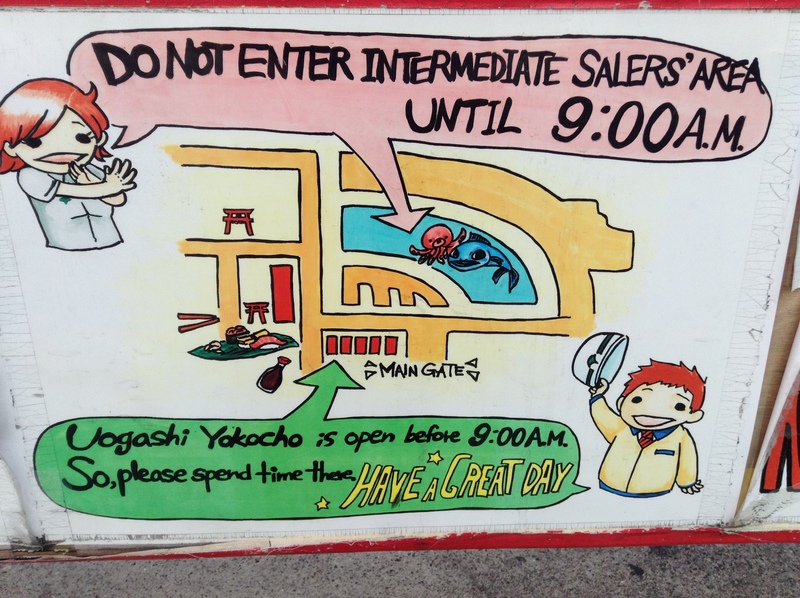 Tsukiji Market’s scheduled move to Toyosu on November 7th came to a sudden halt yesterday. For our Food Sake Tokyo business this has ramifications as we do many tours each week to Tsukiji Market. Following is information that has been culled from the news the last few days and what I find interesting regarding the world’s largest fish market and its potential move from Tsukiji to Toyosu. Here are some interesting tidbits worth chewing on. Tsukiji Market has been in operation since 1935. There is a wholesale seafood and a produce market at Tsukiji Market in the jōnai (inner market). Originally the jōnai was a market only for professional buyers and Shinji worked there as a buyer for a large retail and restaurant chain in Tokyo. There are roughly 800 shops in the inner market. The inner market has become a popular tourist destination. In the past you could go in at anytime, including to observe the tuna auction. At one point the visitors to the tuna auction were intruding into the auction space, touching tuna, jumping on the moving turret vehicles and becoming a nuisance for the workers. So, Tsukiji now limits the number if visitors to the tuna auction to 120 per day. One must now go early in the morning to hopefully get one of the golden vests that will allow them into the tuna auction. For those who still want to experience the wholesale seafood market they must now wait until 10 a.m. to see the shops selling tuna, frozen, fresh, and processed seafood, as well as the produce market. So, why is the market even moving? The current Tsukiji Inner Jōnai Market has been around since 1935. There are no walls in the market so animals such as cats, crows, seagulls, and yes, even mice are in the market. No walls also means that the market is not refrigerated. In the summertime the market can get upwards of 100 degrees. Seafood is kept on ice and there are superfreezers (-76 degrees F). 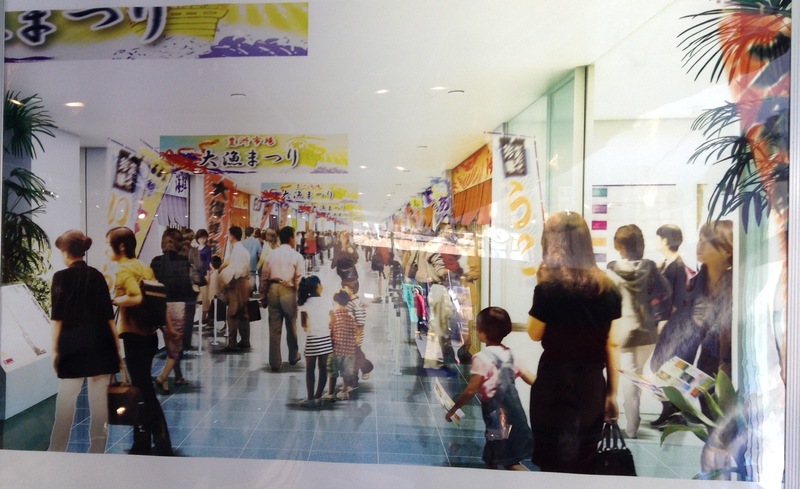 The market needs to be modernized and that is how the new Toyosu Market came into existence. The new facility is refrigerated and walls will keep out animals and tourists. Visitors to Toyosu will be able to observe the tuna auction, but from a second floor overlooking the auction. At least this is how we are told it will be. What about the Outer Market? Is that also moving? There are about another 600 shops in the outer market that sell knives, pantry staples like kombu and katsuobushi, and there are also many restaurants in the Tsukiji Jōgai Outer Market. The outer market ill NOT be moving to Toyosu. What about the Tsukiji 築地 name? The new market will be called Toyosu Shin Shijō 豊洲新市場, Toyosu New Market. The Tsukiji brand name will stay with the outer market shops which are not moving. Naturally, the outer market shop owners are concerned about their business in the future as some of their business comes from buyers going to the inner market. Some of the outer market shops, like Tsukiji Masamoto knives, also have a sister shop in the inner market. So, shops like Tsukiji Masamoto will be able to have a shop in both locations, but this is unusual. Most shops are either in the inner or the outer market, not both. Where is Toyosu Shin Shijō? The new Toyosu market is only about 2 km away from the current location. However, it is not as easy to access as Tsukiji market. Tsukiji is near two subway lines, the Oedo and the Hibiya lines. Toyosu is accessible by monorail and inconvenient for most people. It is said that about 42,000 people come to the inner market daily. How do the fishmongers feel about the move? 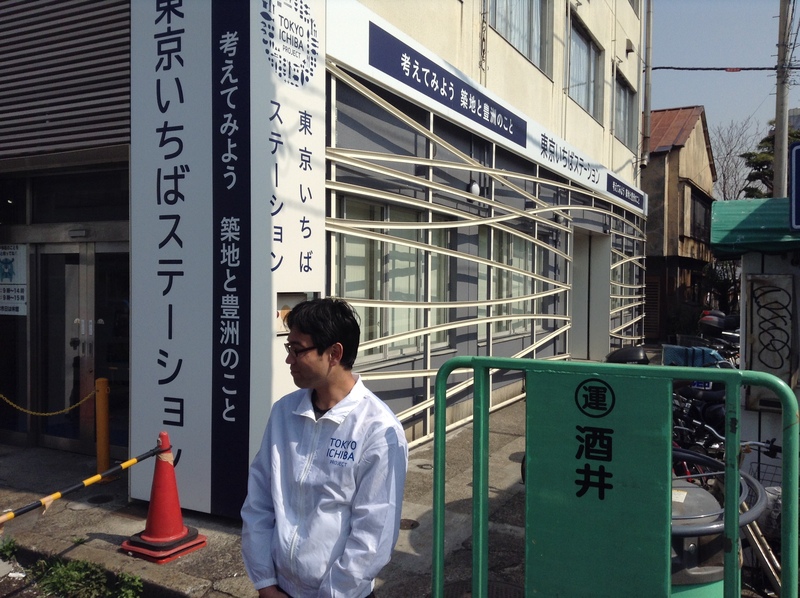 Some are for the move, like 3rd-generation Tsukiji fishmonger Yoshikatsu Ikuta (Twitter https://twitter.com/ikutayoshikatsu) is for moving to Toyosu as soon as possible. Others do not want to move. Bottom line is that the current facilities need to be renovated and modernized. What is the talk about the 2020 Tokyo Olympic and Paralympic Games? The move to Toyosu was decided before Tokyo was award the 2020 Tokyo Olympic and Paralympic Games. The fact that Tsukiji needed to be upgraded was decided in 2001, 15 years ago. The move was supposed to have taken place last year, in 2015. The move keeps getting pushed back. As part of the bid for the 2020 Tokyo Olympic and Paralympic Games the package included a road that would connect Toranomon to the Olympic Village which will be on an island next to Toyosu. The road would be constructed through the current Tsukiji Inner Market. When Tokyo was named as the host city, then the move date was finally set as November 7th. This date was selected based on how much time it would take to tear down the inner market and to build the road. So no, the market is not moving because of the Olympic Games. The move was decided long before Tokyo was announced as the host city. So, going forward, what do we know? On Wednesday, August 31, 2016, Tokyo Governor Koike, who is new to her position, announced that Tsukiji Market’s scheduled move to Toyosu on November 7th will NOT happen. Keep in mind that she is a former Environmental Minister and has been keenly on top of this topic for years. Also, that she inherited a project that is has apparently been poorly managed and over budget. Koike outlined three main points for the delay in a press conference yesterday. 巨額かつ不透明な費用の増加 Unclear costs that have ballooned. Why? 情報公開の不足 Poor communications between related parties. The land that Toyosu is being built on used to be a coal plant making gas for Tokyo residents. While the grounds have been sanitized the tests clearing it as safe have not been completed. Recent water tests have also come back as not safe. The safety checks are coming back with benzene as a product that is in the area. Benzene is a cancer-causing chemical, that is often used as a gasoline additive, so it is not a surprise that it is here. It is a disappointment that it was expected to be removed from the grounds before the move and that it still exists. Bottom line, the market feeds the Tokyo metropolitan area and needs to be cleared as a safe area to host a market that trades raw seafood and produce. Construction costs have ballooned three times over what was budgeted. Delaying the move will also add to costs as it is estimated it will cost $70,000 USD per day for the Toyosu operating costs, even when it is not occupied. There needs to be better communication between all affiliated parties, which has not happened to this point. Koike has said she has put together a Project Team that will analyze and make recommendations following the next results of a safety check of the Toyosu area. The next results are scheduled to come back in January, so until then everything is put at a halt. Leading the project team is a lawyer, Kojima-san, who worked under Koike when she was the Environmental Minister. There are some issues with the current Toyosu, including the fact that the size of the stall is smaller than the Tsukiji location making it hard for workers to work with knives. There are also concerns about the turrets moving up and down ramps and being able to make sharp turns in the tight space allowed, so other safety issues are being raised with the already developed facility. If the market does move to Toyosu, will prices go up? From our friends who drive to Tsukiji for work, they have said that while cheap parking exists at the current location, the new Toyosu parking is expensive. So their business costs will go up, which may be reflected for higher prices for smaller shops and businesses. Is there a chance that Tsukiji will not move to Toyosu? Koike said that she can’t rule it out. It will depend on the results of the Project Team. Bottom line for now is the safety of the Toyosu land and water. Until January the move is put on hold. We can only wait for updates from the Project Team and the results of the safety check which will be announced in January. “Tōmin first” has been repeated many times, “Tokyo citizens first”. 9/2 Koike mentions HAACP in a press conference. This is a food safety management system that did not exist in 1935 when the market was built. From what I have heard from planners of the Toyosu Market, the whole facility will be HACCP certified. The world’s largest seafood market is moving in November. Following are a few basic need-to-know details on the move. It is not the whole market that is moving, just the jounai 場内 (inner market), which is the wholesale seafood section. The jougai 場外 (outer market) is staying and in speaking with many shop owners in the outer market, they are hoping that tourists and locals will continue to come and shop here. What is the difference between the jounai and the jougai? The jounai is where the chefs and seafood buyers go early in the morning to buy seafood and produce for restaurants and retail shops. The number of shops in the jounai is roughly about 800 shops. This is only open to the general public after 10 a.m. (As of July 1, 2016, the 9 a.m. open has been changed to 10 a.m.) Before that it is restricted to buyers and sellers. There are some restaurants and shops to the side of the wholesale seafood section, including popular sushi restaurants and purveyors for pantry items, tableware, and kitchenware. The jougai is the outer market that sprung up naturally around the inner market. Here there are roughly 500 shops and restaurants. This is always open to the general public. There are only a handful of seafood retail shops here. There are many restaurants and retail shops selling everything from tea, knives, sea vegetables like nori and kombu, katsuobushi (smoked skipjack tuna flakes), dried beans, and much more. There is some anxiety with the outer market shop owners as they have no idea how their business will be affected after the move of the inner market to Toyosu. Toyosu, the new location for the inner market, is also built on reclaimed land, like Tsukiji. It is only 2.2 km (or about 1.5 miles) from the current location. It is just along Tokyo Bay, heading in the direction to Narita airport. The Toyosu Ichiba (market) will have three buildings. One for wholesale seafood, a second for wholesale produce, and a third shop for restaurants and retail shops. The popular shops currently at Tsukiji Market like Daiwa Sushi, Sushi Dai, and others in the Uogashi Yokocho, are considered part of the Inner Market, so are scheduled to move. I don’t think all of the shops are planning on moving, especially those with older owners who have no one to pass it on to. The three buildings are separated by large streets, so getting around the three buildings will be much harder than the current layout at Tsukiji. To see the seafood and produce markets in the new Toyosu Ichiba, visitors will be on the 2nd floor looking through glass down on the market. The good news is that more people will be able to witness the tuna auction. The bad news is that for those who love seeing the seafood up close, it will be hard to see from a distance. To access the new Toyosu Ichiba, visitors have to ride the monorail. It is very inconvenient, compared to the current location. The Tokyo Government, which owns the land for both the current inner market and Toyosu, has said that it will provide buses to the new location, but no schedules have been announced, again creating anxiety for those who rely on the market for their work. Currently many Ginza sushiya can ride their bicycle to Tsukiji. The new location will still be accessible by bicycle, but not as convenient as the current location, and not good when it is raining. The outer market, jougai, that is staying has built a new building that will house 60 shops from the current jounai. Here is a list of the shops that will be staying at Tsukiji. It is a nice mix of vendors (some shops in parentheses) selling tuna (Yamayuki), fresh seafood (Yamafu Suisan), shrimp, processed seafood, and produce (Kushiya). We are looking forward to seeing this new building when it opens up. At the moment, regarding our Tsukiji tours, we plan to continue to offer the tours in the current location as visitors will be able to see the seafood up close. Our tours are different from the other tours as Shinji used to be a buyer at Tsukiji so he can talk in great detail about seasonal seafood. Our visit to the outer market stops at many shops selling staples to the Japanese pantry. As we are both trained as chefs we can help explain the different ingredients and how they are used in the Japanese kitchen. 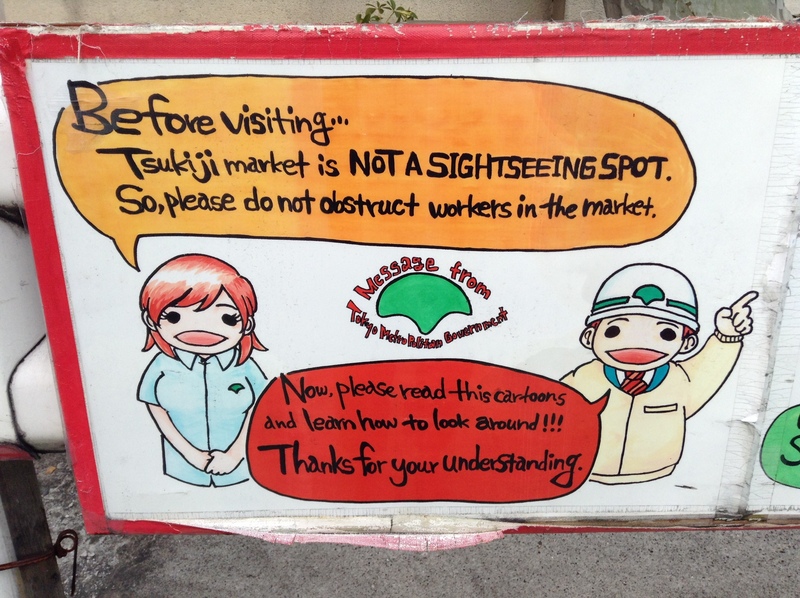 We will update this blogpost once the Tsukiji Uogashi Market opens with details on how it is. When is the big move? The current inner market’s last day is November 2nd. The vendors then have a few days to move to the new location. The new Toyosu Ichiba is scheduled to open on November 7th. Here is the calendar for Tsukiji. Finally, the name of the new station on the monorail is not Toyosu Ichiba, but Shijomae. Regarding the move, the current location was built in 1935 and needs to be modernized. It is too costly to build a temporary market and move it back here, so once it moves to Toyosu, it will stay there. Part of the land that it is currently on will be used to build a road that will lead out to the Olympic Venues and housing for Olympic athletes. What will happen to the rest of the land is still undecided. Some ideas that have been offered include high-rise condominiums or even a casino. The move was supposed to have happened in 2015. Some complications with the new site have delayed it. However, with the 2020 Summer Olympic Games around the corner, the move can not be delayed any longer. To see more on the new market, there is a visitor’s center at Tsukiji Market that you can stop by to see more. 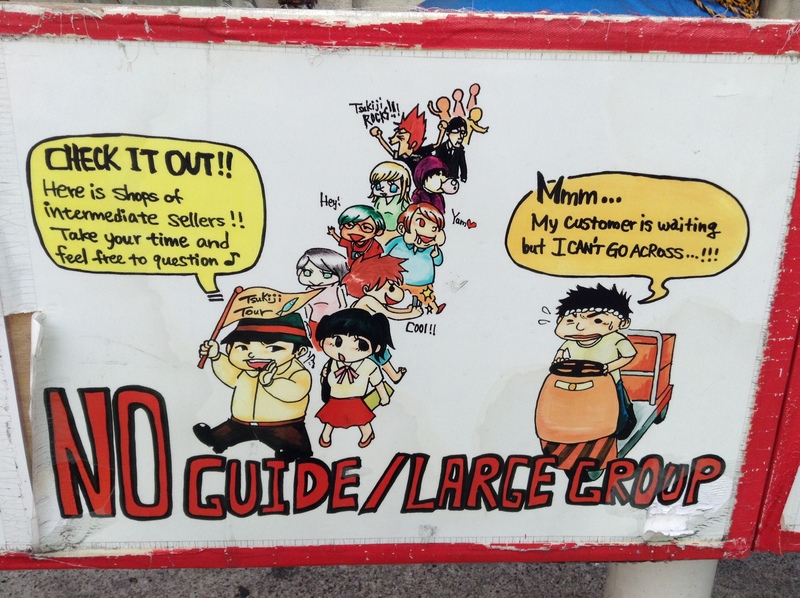 These signs are posted at one of the entry points to the inner market (jōnai) of Tsukiji Market. Some great tips here for visiting the inner market. Most importantly, stay out of the way of the workers. It is a working market, so be aware of workers trying to get around you. The inner market opens to the general public at 9:00 a.m.
Avoid going into the market in large groups. 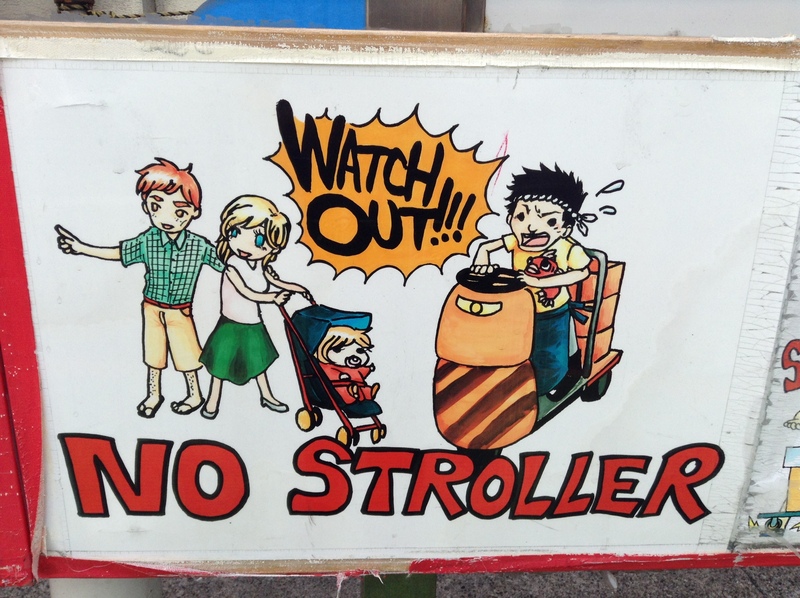 So obvious yet there are still visitors pushing around their kiddies in strollers in the inner market. 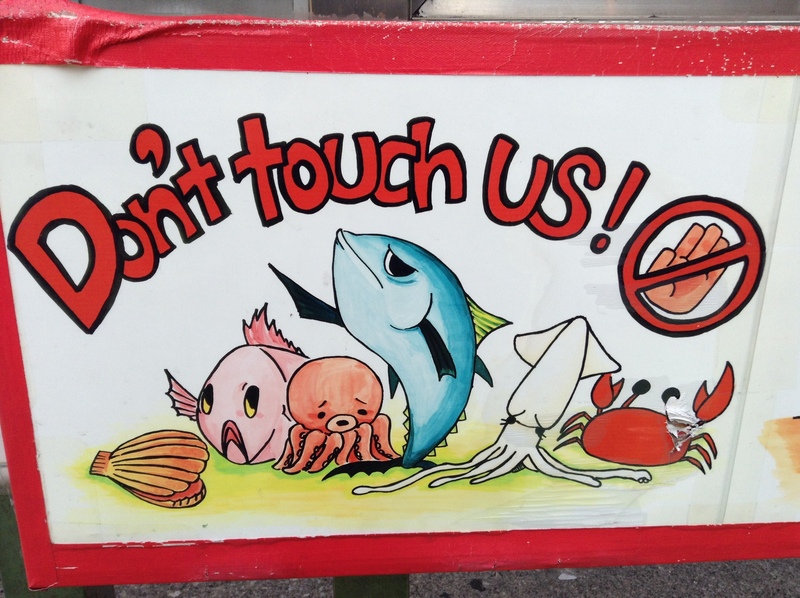 Of course, don’t touch the product. Wear comfortable shoes that can get wet. Travel lightly. No large backpacks or rolling suitcases. Photos are fine, but no flash as the fishmongers are working with knives and it’s dangerous. Great shops selling knives, tea, and more in the outer market. Note that many of these are cash only shops. Be sure to check out the Tsukiji Market calendar online to see if it is open. Usually closed every Sunday and every other Wednesday, but not always. 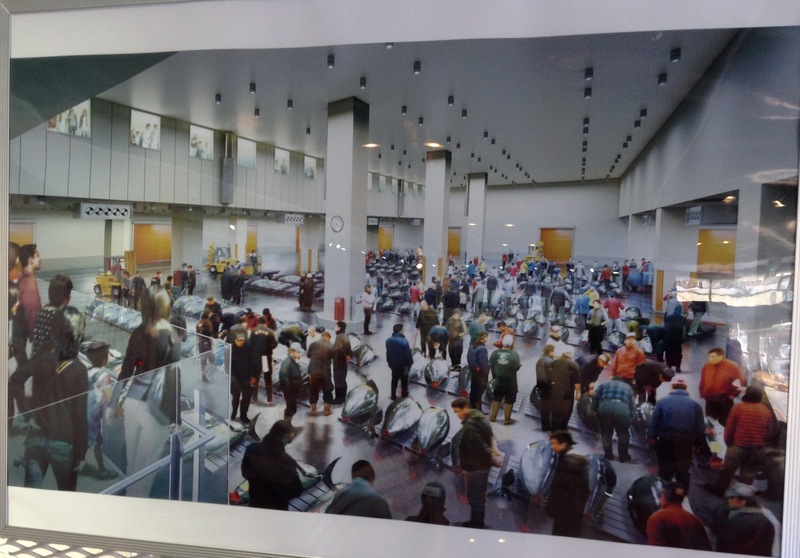 To see what the new Toyosu Market will look like when the inner market of Tsukiji moves, check out the Tokyo Ichiba Project Museum. Start your morning with Tsukiji’s best coffee at Turret Coffee, which opens at 7 a.m.
We offer tours of Tsukiji Market. Details are here about Food Sake Tokyo tours. An article I wrote about Tsukiji Market and some key shops worth visiting for The Japan Times. It is no news that Tsukiji Market’s Inner Market, Tsukiji Jōnai Ichiba, will be moving in the next few years. While the government is saying 2016, our friends who work in the market are telling us it is more likely to be 2017. For sure the market must move by 2018 so that preparations for the 2020 Olympic Games can start. Last I heard the media center would be stationed here. The media center then would be taken down after the Paralympic Games and high-rise condominiums will be built here. UPDATE as of 23 Aug. 2014: Recently did a tour with some clients who are in Tokyo with the International Olympic Committee and they tell me that the press center will NOT be going to where the current Tsukiji Market is. Of course, that could always change. Also, yesterday while visiting this Tokyo Ichiba Project we queried the staff and they tell us the market will not move until 2017. As for the Outer Market, Tsukiji Jōgai Ichiba, it will stay as it is. 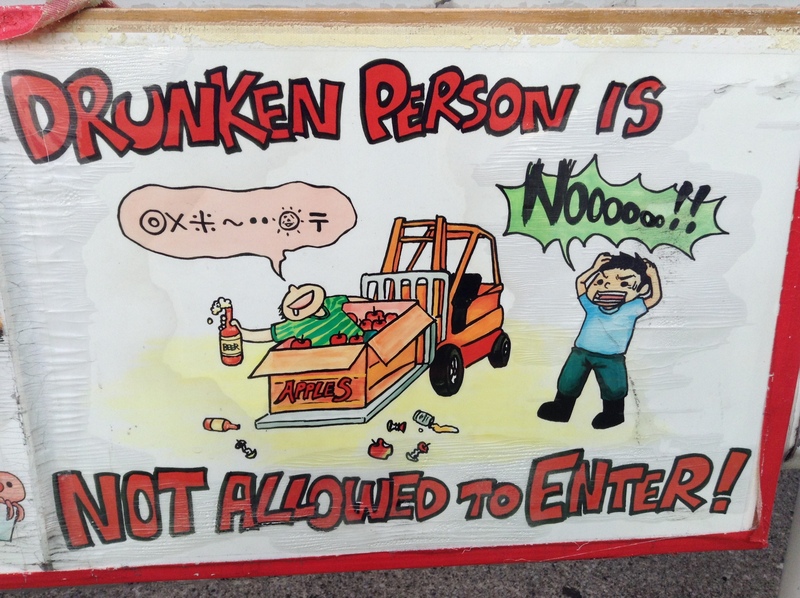 The Outer Market is always open to the general public. It is the Inner Market where the wholesale seafood is, as well as the famous tuna auction. What is up with the future market? To get a better idea, be sure to stop by the Tokyo Ichiba Project museum which is located inside of the market. The museum has pictures of the future market as well as a three-dimensional models. Here is an overview of what the Toyosu Market will look like. One of the attendants in the museum said that the market name will change from Tsukiji to Toyosu once it moves. Perhaps the current Outer Market will continue to be called Tsukiji. It is very interesting as the models also show how the new market will be broken up into three different complexes with each building having a few floors. The monorail is also shown so that visitors will have an idea of how to access the Toyosu Market. A photo of the tuna auction at Toyosu. Visitors will be able to view from a second floor viewing platform and from side windows. The brand new facilities will be temperature controlled. There will be many restaurants for visitors. What is not shown at the museum, but what has been shown on television is that a hotel will also be built here. There will also be a hot springs at the hotel with an outdoor onsen on the rooftop that will overlook Tokyo Bay. It is slightly more convenient for the delivery trucks to access, especially for those that make the trip to Narita airport. This PDF has a map of the new facility compared to the current location. * The new market is only 2.3 kilometers from the current location. * Toyosu Market will be accessible by the Yurikamome monorail. * The stop for the Toyosu Market is called “Shijo Mae”. open from 9 a.m. to about 2 p.m.
FNN News in Japan has reported that Tsukiji Market’s move to Toyosu has been extended one more year to March, 2015. Part of the delay is due to the amount of time that is needed to clean the soil in the new location. While the move was scheduled for sometime in 2014 it’s been pushed back one year. Good news for all of us as the new location is very inconvenient to get to for visitors as it is located on the Yurikamome monorail. The current location is a short walk from the nearest station and a comfortable stroll to Ginza. Here is the FNN News video (in Japanese). NHK reports on the evening news that it has been decided that the world’s largest seafood market, Tsukiji Market, will move to Toyosu in 2014. While the information in this brochure is in Japanese, if you scroll down you can see sketches of what the future market will look like. Space has been reserved to allow for tourists to overlook the market (I believe on a higher level so as not to get in the way of the workers). There will also be a shopping area and restaurants for the tourists. The link to the brochure above also has a map showing the current location and where the new market will be. As you can see, it is not very far from the current location.